Izán Cavanna together with its Sailing School, Cavanna Wind, is one of the most emblematic hotels on the Costa Cálida. It is located in one of the best areas of La Manga, at the foot of the beach, on the very edge of the Mar Menor and a few meters from the Mediterranean Sea. 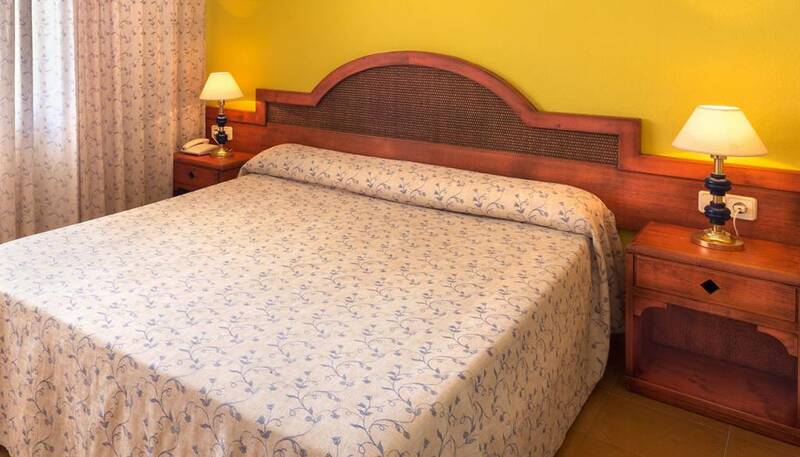 With excellent facilities and enviable location, the hotel is the ideal setting for your holiday if you want to enjoy watersports and relax throughout the year. 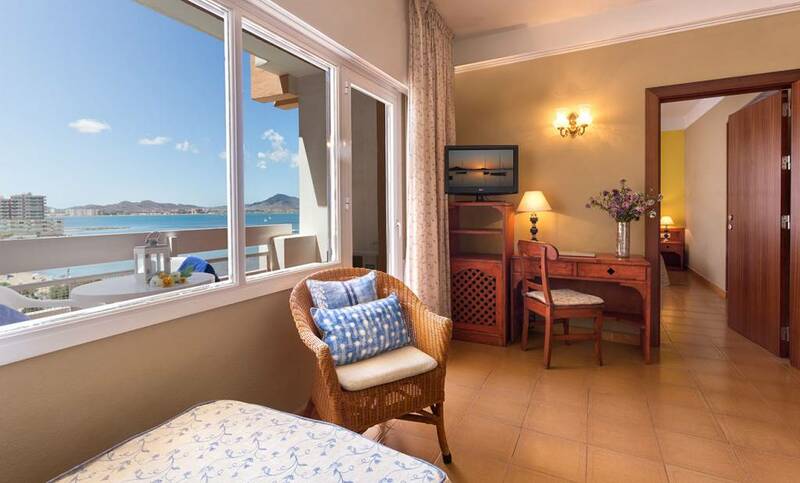 From its terrace, you will be able to see the spectacular views of the Mar Menor or of the Mediterranean Sea and enjoy the breeze from the seafront. Exterior and bright, perfectly air- conditioned, it has free Wi-Fi, an optional minibar and a safe (additional cost). Crib available upon request. 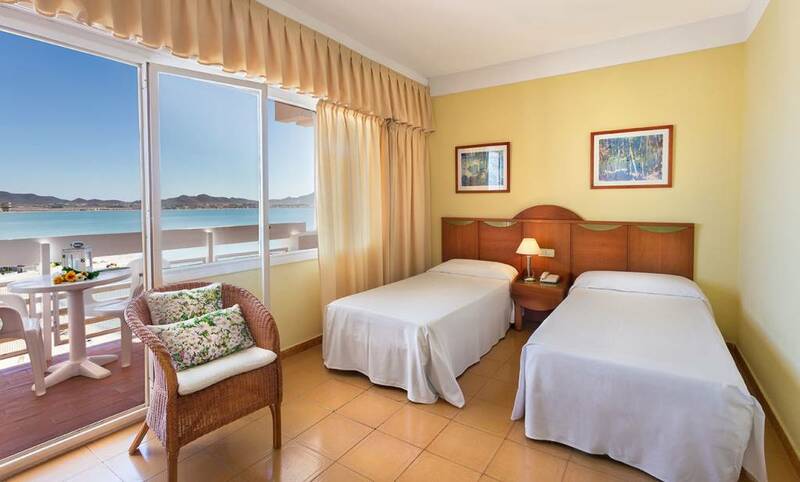 Gaze at the beautiful sunsets over the Mar Menor from these comfortable and spacious rooms with a terrace. Renovated and decorated with a modern and minimalist style, it has air conditioning, free Wi-Fi, an optional minibar and a safe (additional cost). Designed especially for families with children, this type of room guarantees comfort and safety for all the family. Enjoy a well-deserved break with one-of-a-kind landscapes. Perfectly air-conditioned, it has free Wi-Fi, an optional minibar and a safe (additional cost). Crib available upon request. Exterior and bright room, perfectly air-conditioned, it has free Wi-fi, an optional minibar and a safe (additional cost). 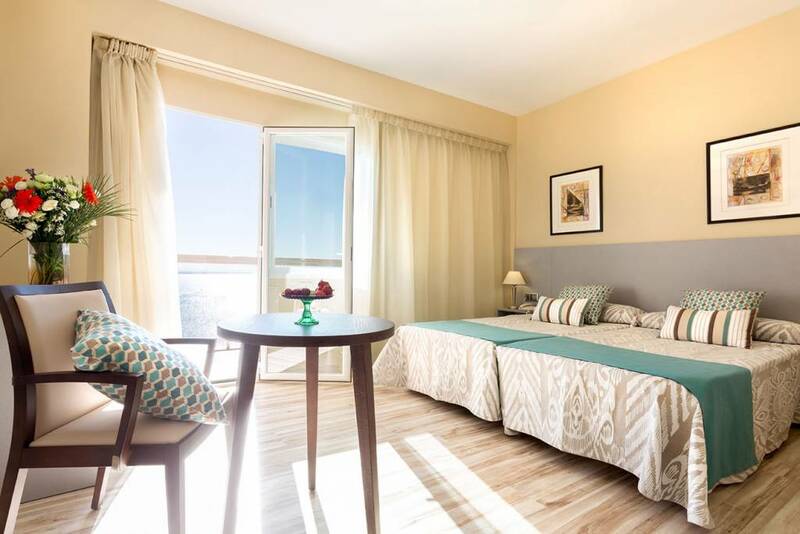 Relax with the serenity of the Mar Menor and enjoy pleasant accommodation in this comfortable room for one person with all the services that will guarantee an enjoyable stay. Our best winter offer, up to 10% less! If you are looking to disconnect for a few days, don’t wait any longer. We will apply this offer to reservations for stays of at least three nights. Hurry up! Only until 28/05. This offer is non-refundable. Enjoy our special tasting menu with our exquisite cuisine in an enchanting setting, gazing at magical sunsets over the Mar Menor. We offer you a wide and tempting selection of dishes from our healthy Mediterranean cuisine, as well as products and dishes reflecting other European cuisines. A place with pleasant views of the sea and the swimming pool where you can enjoy a coffee, a snack or beverage, etc. at any time... You will also be able to watch sporting events in our TV-sports area. Gazing at the sunset, you will be able to enjoy our pleasant terrace having a refreshment or drink while enjoying the entertainment shows. An English Pub perfect for listening to good music in a pleasant and relaxed atmosphere accompanied by an excellent drink with the best domestic and imported drinks. We offer a wide range of relaxation programmes and body treatments. Massages are one of our specialities. It has a heated pool and a hairdressing service. Cavanna Wind, our sailing school, offers you a wide variety of services and courses for all ages. Take advantage of your holiday and learn, perfect or enjoy renting our boats. Sailing on the Mar Menor is a true privilege, its mild winds make it the perfect place for people who love water sports and those who are looking to relax and have fun in a unique atmosphere. Beginners will find the perfect conditions in the calm waters and experts can also choose to face the waves of the Mediterranean. On this day that is so special, enjoy a warm and welcoming atmosphere; we have the perfect relaxing place surrounded by the Mediterranean Sea and the Mar Menor and its large gardens where you will be able to hold an unforgettable reception. Depending on the season, you will be able to enjoy a cocktail in the gardens with the nice sea breeze. Our team of professionals will make sure that everything goes perfectly. Its spacious halls and calm atmosphere make Izán Cavanna hotel a perfect place to hold your meetings. Ask about its three specialised halls for meetings, conventions, congresses and incentives with space for up to 370 people and totally adaptable to your needs. Services in the halls: Wireless system, audiovisual equipment and heat/air conditioning. Celebrate your little ones’ big celebration day together with your family and friends. In our large halls, you will be able to celebrate baptisms, birthdays, communions, costume parties, etc. We will organise your decorations and favourite entertainment just as you want, together with your preferred menu choice. After, they will be able to play and run around our gardens and playground. An ideal destination for a family holiday or those days of relaxation you so deserve. With our great team of monitors, you will have a unique experience doing water sports like windsurfing, dinghy sailing, catamaran, standup paddleboarding, etc. or on board our sailboats sailing through its spectacular sunsets. An endless number of choices await you: picturesque fishing villages, environmentally valuable protected areas, thousand-year-old cities and its delicious seafood cuisine with the traditional Caldero del Mar Menor. The Cabo de Palos and Islas Hormigas marine reserve is a natural undersea space protected because of its great biological diversity and the well kept state of its seabeds that together with the many historic shipwrecks it is home to, make it an exceptional place for scuba diving and cave diving all year round. It is currently rated one of the most amazing oceanographic locations in the Mediterranean and one of the best diving destinations within Europe. The cathedral, the Salzillo Museum, Romea Theatre, town hall and casino are noteworthy places. Interesting festivals for tourists: Easter and Spring Festivals. Famous for its gastronomy with traditional dishes like zarangollo, pisto, the Murcia style salad and rice with vegetables or beans. We recommend visiting the municipal archaeological museum, Roman theatre, the Roman forum district and Punic and Byzantine walls. It has baroque, neoclassical and modernist buildings. Its two holidays that stand out and are popular throughout the country are Easter and the Carthaginian and Roman Festival. It includes several municipalities with Moorish heritage with lush gardens watered by the Segura river. We recommend that you visit from February to April to see the flowering of the many different fruit trees. In its age-old cuisine, its famous sweets and renowned Ricote wine stand out. It is one of the five holy cities of the Catholic religion. What stands out is its beautiful medieval quarter and its real gem, the Real Basílica-Santuario de la Vera Cruz where the famous Caravaca cross is worshiped. Its local holidays from 1 to 5 May are declared of International Tourist Interest.